﻿ English Daily Workout: News Video and Comprehension Quiz on "Danger of Japan's Nuclear Plants"
News Video and Comprehension Quiz on "Danger of Japan's Nuclear Plants"
nuclear power plant -- cooling system -- declare a nuclear emergency -- evacuate their homes -- operated by Tokyo Electric Power -- nearby turbine building -- radioactive leak -- to cool down the Fukushima reactor-- restore power to the plant -- the possibility of some sort of core meltdown -- a string of volcanic islands -- US Air Force planes brought coolant -- release radioactive vapor to decrease pressure. 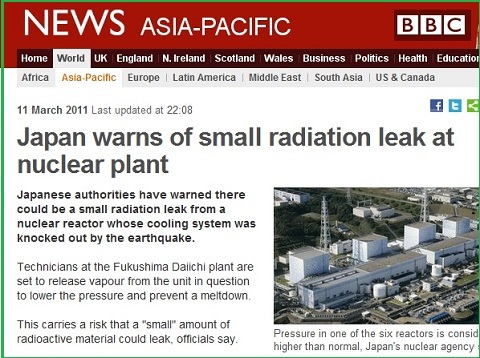 According to these phrases what seems to be the key issue with Japan's Nuclear Plants? The cooling systems of some nuclear plants have failed, part of the reactors could consequently melt down and release radioactive substances. Read the transcript here to check your answers. Future in the Past : Would, Past Continuous, Going to, and Was/Were to"
Future in the Past: Exercise on "Going to"
Angry With or Angry At? Get a Daily English Workout in your email inbox! English Daily Workout. Powered by Blogger.